Bead embroidery is one of is one of those types of needlework that you just want to look at and touch. 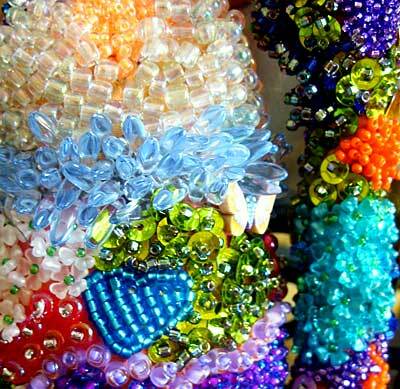 I don’t do a lot with beads myself, but I love, love, love to see what others do with them! 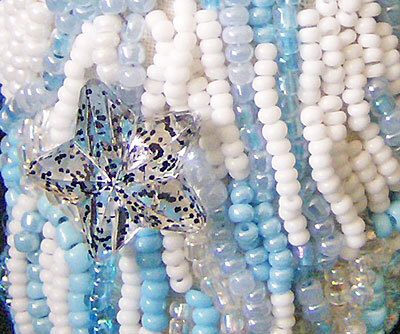 The color, the sparkle, the texture – what’s not to like about beads? I think I was a crow in another life… I hone in on sparklies! 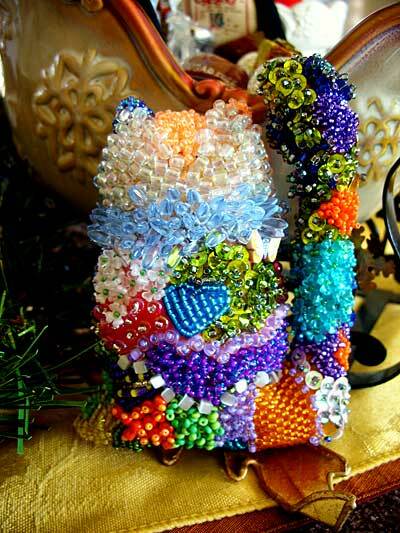 Today, it’s a pleasure to share with you Velia’s bead embroidered sculptures. Velia is a reader here on Needle ‘n Thread, and when I spoke of curved beading needles last week, she wrote to tell me that she uses them all the time, but it took her a while to get used to them. She attached a photo of what she does with curved beading needles. And, of course, I wanted to see More! So she graciously allowed me to share her work with you. I wanted to share it, because we all need a splash of color in our day! This was the first photo I saw of Velia’s bead embroidery sculptures. It’s a hippo! 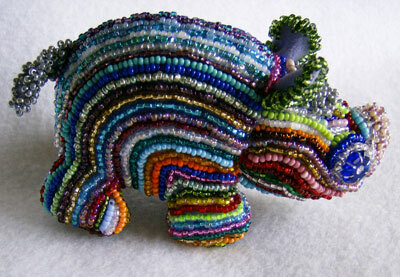 A hippo encrusted with beads! And it is adorable! Of cours, I wanted all the details – how big is he? What is he made out of? What size beads did you use? And Velia answered. 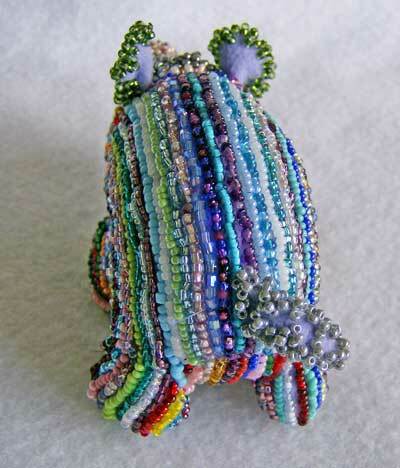 A beaded Beanie Baby! Isn’t that Brilliant? But Velia also makes her own sculpture forms and beads them, too. Take, for example, Phyllis the Cat. Phyllis is completely decked out in all kinds of beady bling! Front and back, she is a feast for the eyes! I love the beads around her collar and the green sequins and seed beads! 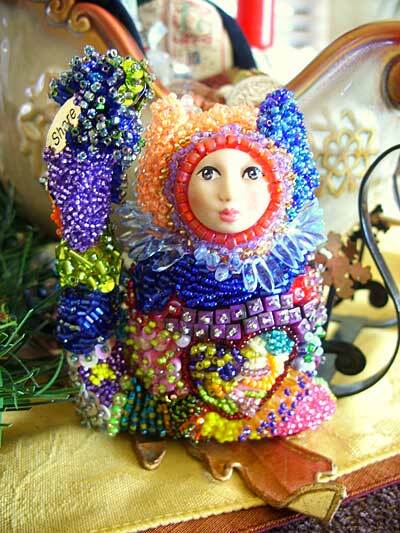 The Snow Maidens are little Matrushka dolls – there are three dolls, stacked inside each other here, from 3″ in size, to a little 1″ doll! 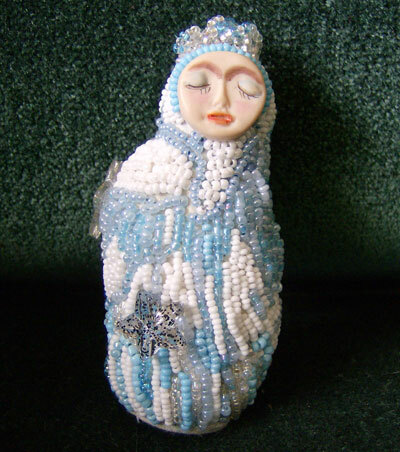 The colors, the sparkly star – a very aptly named Snow Maiden! 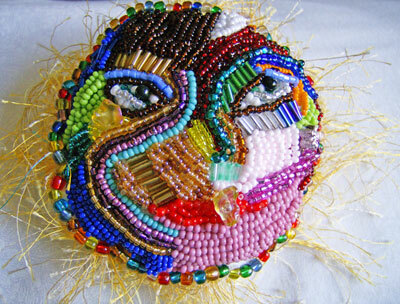 How about a beaded face?! … a little elephant! I love the eyes and ears on this piece – and the color on the hindquarters and back! I can’t wait to see how this exotic little fellow finishes up! Velia makes sculptures on commission, too, so if you have any interest or any questions for her, drop me a line, and I’ll see that she gets it. Thanks a bunch, Velia, for sharing your work! 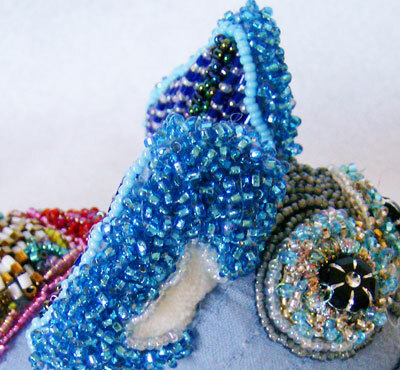 You make bead embroidery look so fun! I love the snow Maiden!!!! What a cool idea!!! Dear Mary, What a wonderful idea! I just love the colours. 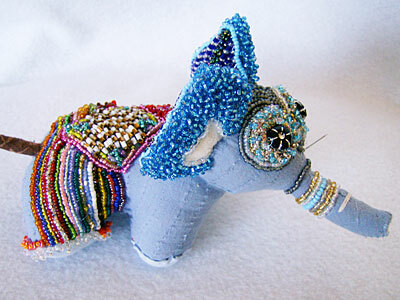 Now that is one way to use all one’s excess beads. This is for sure something I will put on my to do list for crafts. 🙂 Thanks for sharing Velia and Mary. Now where to get those curved needles in SA ? LOVE! Especially the hippo and the elephant. Wow Velia,, these sculptures are exquisite. I’ve never seen such a thing. I love the cat and the snow queen. You are a true artist. Thankyou for sharing with us. Such beautiful work, and so creative! Now I want to do this. When do we get step-by-step instructions? Adorei a idéia, tenho uns bichinhos guardados, vou aproveitar e decorá-los com miçangas. Cores muitas cores. Mary, adoro seu site, Deus a abençoe pela iniciativa. WOW…these are way cool!!!!! Love them!!!! Sweet and intriging! I was just telling a friend yesterday that there are so many many techniques with needle and thread that I can’t imagine ever running out of interest or inspiration. A few years ago at the Houston Quilt Festival (the Big One) they had a section in the vast exhibit space for beadwork. One woman (sure wish I could remember her name) did classic sculptures — labeling her work as “if Michaelangelo had beads instead of marble…..” They were all of a single color bead (ecru/marble-like) and about 10″-12″ high. It was so amusing and still sticks in my memory. I love creative people! This is amazing work, Velia! Thanks for sharing it here. Wow! I was at a surface design show in my town. Someone took some of the head forms that folks use to display hats and encrusted them with beads like this. The heads were black and like velvet. They used gold or silver beads and made them look very tribal. Like these sculptures, they were fascinating to look at. I like yours better, Velia, because they are colorful. These must take you forever to make. 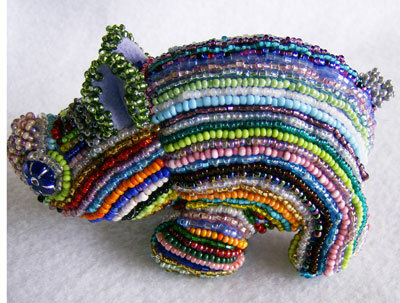 I love beads too, so I’m curious how are the beads stitched on? One bead at a time, several? I love the elephant and would love to see a finished picture! it’s very cute. I did not know this technique. thank for having shown it. Thanks Mary for sharing Velia’s work. I am grateful to Velia too, Thank You for enriching my world with your creativity and talent. I love these! The end result is like crazy quilting, minus the quilting. Brilliant! !